Interests - **Please do not send food** Isla collects Num Noms, Lol dolls, Girly blind bags, hairdorables, mystery minis, hatchimal mini eggs and my little pony. She likes listening to Ariana Grande, Little Mix and Ann Marie. She enjoys makeup, nail varnish, hair accessories, Disney princesses, shopkins, arts and crafts and stickers. She also loves Jojo Siwa and her bows! Isla is yet to be diagnosed properly. Since the age of one, Isla has been unfeedable and is totally TPN dependant. TPN is artificial feeding through a main vein next to the heart through a central line. Isla has inflammation of her bowel which had left her unable to be fed. Isla has not responded to treatment for this. She also has a large bowel that doesn’t work properly so has an ileostomy. Isla suffers from lots of infections due to bad bacteria and spends a lot of time in and out of hospital. Isla suffers from kidney problems which have started this year and again are yet to be diagnosed. She often gets urine infections as well as line infections which leave her very poorly. We don’t have a long term plan for Isla as yet but we are hoping that doctors will be able to do this for her soon. Isla’s recent biopsy results showed pancolitis which means her entire large bowel is inflamed. There is also active inflammation in her small bowel, and ulcers on her oesophagus and stomach. She has been on high dose steroids since Christmas and is responding well. She’s just feeling a little bit down because they have made her put on weight and she doesn’t like the moon shape face they give her. Isla is booked into have surgery at GOSH in early March to remove her large bowel. Isla has been on a roller-coaster regarding her health. She recently has a serious line sepsis that involved the paediatric cats team being called out to her twice. She is still suffering with pain and lethargy. She is now under 5 teams at gosh as she has reoccurring urine infections and a low score bone mineral density. We don’t really have a plan at the moment for how to move forward health wise, we just take each day as it comes. Isla has had a really tough few months. She has an ongoing Candida infection that she needs to keep having IV antifungals for. 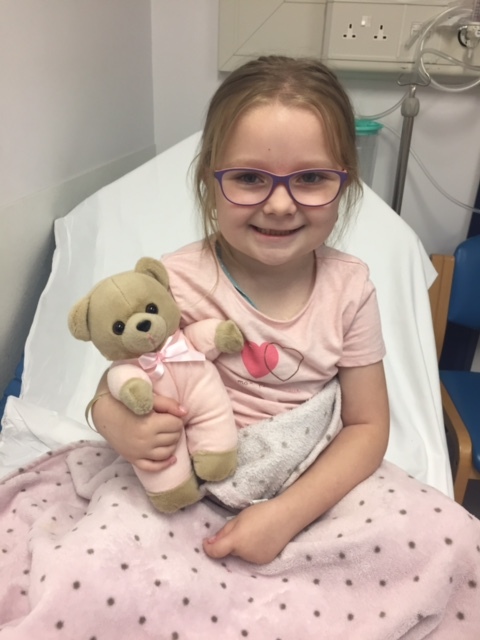 Isla’s recent admission to GOSH for scopes revealed severe inflammation of her large bowel and after the procedure haemorrhaged and lost a lot of blood. Plans are being made to admit her for surgery and have a total colectomy. Endocrine tests revealed an hormone deficiency so further tests are being planned to investigate further. She’s been spending more and more time in bed, feeling unwell and pain levels increasing. It’s really hard to motivate her to do the things she once loved despite us trying so hard. Isla has been struggling with an ongoing line site and gastrostomy infection and has been on iv antibiotics for over a month. Unfortunately it’s been decided that she will need to lose this Hickman line and a new one will be inserted. Isla also has a weeks admission middle of October with the endocrine team at GOSH. Isla’s had a yo-yo few months, she has been fighting an ongoing pseudomonas infection of her line site which once treated with IVABS comes back within weeks. She has been fitted for splints for her legs as unfortunately her mobility has deteriorated so will need the splints to help with the muscles of her legs. She was referred to Kings College hospital from GOSH for her liver, as the bloods show increase in liver function is really abnormal now and needs to be managed by a specialist. Her appointment at Kings went well, lots of bloods taken and just today received further bad news, that the bloods have doubled so she will need to be admitted to GOSH for a liver biopsy. Her manometry results show that her colon has completely failed and it has been decided that this year Isla will need surgery to have it removed. Isla’s not had a great month. News from GOSH was that her colon has stopped working completely. We have a date to meet jointly with her motility & surgeon to discuss surgery to have the large bowel removed. She’s also been down on her health. She has grown a bug around her line site and is on iv antibiotics, but we are struggling to clear it. It has also been revealed that’s Isla’s liver function has trebled what it should be. Despite all this she is still happy & smiling just a bit more tired and sensitive and needing lots of mummy time. Isla has had a really good month health wise. She hasn’t needed any hospital admissions and we have managed her at home. She’s due to go to GOSH in February to get the results of all the gruesome tests she had done in October/November. She’s had to have her immune suppression medication increased due to increased inflammation in her small bowel and the levels showing low in her bloods, although this hasn’t stopped her from enjoying her Christmas. Isla has had a really rough October and the majority of it has been spent in hospital. She was admitted for a planned stay at GOSH for an ADM manometry and unfortunately that took a while to recover from. We were home a few days and then she was taken into our local hospital with a high temperature which ended up being because of her diversion colitis. She was needing IV fluids as her stoma output was so high. We then got transferred to GOSH again, who did emergency scopes and a clonic manometry. Unfortunately, Isla suffered too much pain with the manometry and it had to be a stopped, with fears they had perforated her bowel, due to a pocket of air seen on her x-ray (luckily it wasn’t). The pain she experienced was so traumatic that even the consultants gave her cuddles and had tears in their eyes. Discovery from her colonoscopy has shown Isla has a stricture (a narrowing) in her colon, so we are currently waiting another admission to plan what they are going to do with this and also make a decision on whether she will need the big surgery to remove her colon. All Isla’s medications have been upped as bloods show she isn’t absorbing as well as she should, one of these meds is her immunosuppressives so we are expecting a few more blips with her health over the near future. Isla has had a busy month, she was due for her admission to GOSH, but unfortunately due to her inflammation flair up it has been delayed. Instead Isla will be admitted in October for scopes, and a repeat bowel manometry tests under the guidance of the motility team. Isla has had a rocky month. She’s suffering from diversion colitis and a gastrostomy infection that won’t shift. Her inflammation markers are sky high, but until her admission in September, unfortunately she just has to ride it out until then. Isla’s on all the correct medication, immunosuppressives and has done a course of steroids, but unfortunately it doesn’t look like she’s absorbing. Tomorrow IV antibiotics are being started and hopefully we’ll get some stability back. She’s coping well and we are distracting her the best we can. 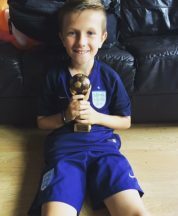 Isla has had a great month. She’s still got ongoing diversion colitis, but she is handling it really well. Had her admission date for GOSH, which is September, if she doesn’t fall too poorly before then. Isla has remained out of hospital, but remains in a vicious cycle of bacteria overgrowth and inflammation/ulceration. She’s finding it difficult to keep her strength up again, and slowly slipping back into sleeping most of the day. She’s been retching and being sick due to her reflux and generally not her happy self. GOSH has kept to their agreement of letting her be at home for 3 months without any hospital admissions, but the end of the 3 months is fast approaching. Isla has generally been quite well. She’s had her new Hickman line inserted and some other tests for her yearly TPN MOT. She’s being treated for bacterial overgrowth and is now on an antibiotic and probiotic cycle, hopefully this will improve some of the horrible symptoms she’s been having. Isla spent the first part of this year in hospital with viral pneumonia and a line infection. She has grown some very rare bugs and they took their time to shift, but we got there eventually. Isla just managed to be well enough to have her scopes done, which we needed to beable to progress on with a plan for the rest of the year. She’s very up and down in health and we literally take it day by day. She will be admitted to GOSH again soon for repeat investigations and possibly big surgery to remove her colon. Isla is currently in hospital and has been since the 29th December, she is very poorly again and are waiting to transfer her over to GOSH. She has been suffering with high temperatures for the whole time she’s been in hospital and the team are trying their hardest to keep her out of PICU, till GOSH can take over her care, when a bed becomes available. Isla has still had an up and down month. The candida infection has left her very frail and weak. She’s been assessed for a wheelchair and one has been specially made for her to carry all her medical equipment for her, as she just doesn’t have the energy to do this anymore (she’s very happy as it’s pink!!) She currently is fighting off a virus and because of this has had to have her procedures at GOSH cancelled, as she isn’t well enough to go under general anaesthetic. We are hoping to spend her first Christmas at home this year! 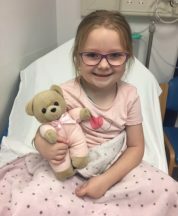 Isla has spent the whole of October in hospital, she got really sick with a candida infection and was transferred to GOSH PICU. The infection has hit her body really hard, she’s having a tough time building herself up. She’s been left very weak, pale and lethargic. She’s very frail and spends her time drifting in and out of sleep, and although we were discharged last week finally, she’s still having IVABs and lots of pain IVs to help her through this tough time. Isla is currently very sick in GOSH with line sepsis. She was taken into PICU and is still struggling to make a recovery. We are yet to see any progress from her so really not in a good place at the moment. Isla’s had a bad month again. She had to have surgery to correct her stoma prolapse issues, after we unfortunately had another blue light ambulance to GOSH, where it had prolapsed and was stuck out. She’s been incredibly brave and is still managing to smile despite all that keeps getting thrown her way. Isla has had a really tough month. Her stoma prolapsed and she had to be rushed to Great Ormand Street for emergency surgery for reduction. This left her really uncomfortable and needing morphine to help with her pain. She is now home again but is still having prolapse problems, so we’re awaiting another surgery date to fix this. Isla is still on her steroid treatment for inflammation of her colon and small bowel, but this is making her moods change rapidly and unfortunately making her quite unhappy a lot of the time. Isla is still very poorly and she was admitted to GOSH for the emergency scopes. This revealed Isla has chronic inflammation that needs to be treated with steroids and more immune suppressive meds. She has a 10 week plan then scopes will be repeated. Isla hasn’t been too well lately, she has an ulcerated stoma and it’s causing her lots of pain and discomfort. We were told she will be admitted to GOSH in July for a 4 week stay for some tests and to try and get on top of her pain. She also has to have some emergency scopes to check she isn’t inflamed inside.